To gather our local bartenders, HRAP staged a HRAP NATIONAL CHAMPIONSHIP themed as "RAISING THE BAR" last JUNE 16, 2017 at THE MAFBEX – World Trade Center. Winners of the Classic Creative Bartenders Choice and the Flairtending will represent the Philippines to the ASEAN BARTENDERS CHAMPIONSHIP that will be held on September this year. The Hotel and Restaurant Association of the Philippines gave its support to IFEX Philippines Asia's Ethnic Food and Ingredients Show held last May 19 to 21, 2017 at the World Trade Center. Top ASEAN food firms, local businesses, manufacturers, trade buyers, and businesspersons gathered and joined the opening of its 11th edition themed as “Taste ASEAN” with over 700 international and local food companies showcasing their products to potential trade partners and buyers. Originally known as the Asian Ethnic Food Festival, the event has grown to be the country’s biggest international trade exhibition that provides platform for local and international food companies. IFEX Philippines is the country’s biggest international trade exhibition in the Philippines which features Asia's ethnic and specialty food, tropical fruits, vegetables, seafood, beverages, bakery and confectionery products, meat and poultry, Halal-certified products, as well as natural, organic, and healthy food products. Since its establishment, IFEX Philippines has provided a business-to-business platform for local and international food companies to discover new markets, launch new products, and transact with the world’s biggest buyers. Organized by the Department of Trade and Industry-Center for International Trade Exhibitions and Missions (DTI-CITEM) the event greets food aficionados to grasp the Philippines newest trends in the food industry. The exhibit also features food companies from Southeast Asia namely, Singapore, Vietnam, Malaysia, Brunei, Japan, South Korea, Taiwan, Cambodia, Turkey, and Myanmar. IFEX Philippines 2017 has taken a blend of Asian flavors, through food, condiments, beverages, seafood, vegetables, and healthy food commodities. An avenue for businesses opportunities gathering nations to appreciate what the Asian market has to offer. Set on April 6-8 at SMX Convention Center, Pasay City, the Asian version of the Spanish culinary conference will again gather top chefs from around the world. Chef Robby Goco, a member of the HRAP Board of Directors and currently the Director for Research and Development & Managing Partner of CYMA GREEK TAVERNA and GREEN PASTURES whose main motivation is to create, innovate and build distinct food service concepts will be doing a presentation on APRIL 08 at THE MADRID FUSION, a multiple ways to prepare goat’s meat. A consummation of Chef Robby’s advocacy to support the local farmers and the local industry. The ASEAN Hotel and Restaurant Association (AHRA) and the ASEAN Tourism Association (ASEANTA) convened its second quarter meeting in Dorsett Hotel, Kula Lumpur, Malaysia on April 1 - 2, 2017. Attended and represented by HRAP President Eugene Yap, the meeting highlights ASEANTA’s SKYCARAVAN Project set to unveil within the year. Discussed also is the much awaited AHRA’s Online Booking Engine, www.smileasean.com as well as the upcoming AHRA Bartending Championship that will be held in Manila, Philippines on September 29, 2017. Latest addition to CNN Philippines Current Affairs program is POLITICAL INSIDER anchored by HRAP Director GILBERT REMULLA. A former journalist and legislator, now businessman (Managing Director of ISLAND COVE HOTEL & LEISURE PARK), the program segment premiered last March 03 at 9:30PM. 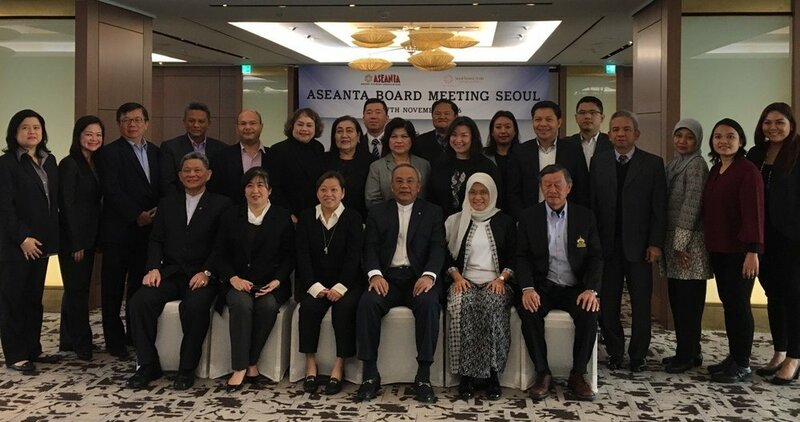 The last quarter of 2016 was very enthusiastic and full of expectation for HRAP President Eugene Yap when he attended both quarterly meetings of the ASEAN Hotel and Restaurant Association (AHRA) and the ASEAN Tourism Association (ASEANTA) held in Seoul, South Korea.